Obama Stimulus is “Ponzi Scheme” Plus Other Criticisms…. “It’s not an ‘economic stimulus;’ its a political pay-off to Democratic contsituencies,” Ben Stein said on Glenn Beck’s Fox News program this evening. “We have to get the banks to lend and lend without fraud,” Stein said. He said a Ponzi Scheme takes money from unsuspecting investors and then never really invests. Any pay-off comes from the money from other “investors” and not from profits. 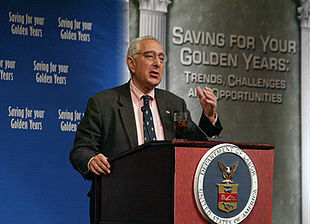 The economic stimulus borrows the money and then simply passes it around, Ben Stein said. “This stimulus will cause an 80% inclease in domestic discretionary spending in one year,” Karl Rove said. And the government pay-out won’t be over after the stimulus. There still needs to be a big bank bailout — maybe to the tune of $3-4 Trillion. Rove said the “stimulus” is full of garbage. Conservative economist Thomas Sowell said the stimulus bill won’t create jobs fast enough and soon enough and the bill is filled with now job-making spending. Sowell is the author of Applied Economics: Thinking Beyond Stage One. Everyone is talking about how much money the government is spending, but very little attention is being paid to where they are spending it or what they are buying with it. The government is putting money into banks, even when the banks don’t want it, in hopes that the banks will put it into circulation. But the latest statistics shows that banks are lending even less money now than they were before the government dumped all that cash on them. Even if it had worked, putting cash into banks, in hopes that they would put it into circulation, seems a rather roundabout way of doing things, especially when the staggering sums of money involved are being justified as an “emergency” measure. Spending money for infrastructure is another time-consuming way of dealing with what is called an immediate crisis. Infrastructure takes forever to plan, debate, and go through all sorts of hearings and adjudications, before getting approval to build from all the regulatory agencies involved. Out of $355 billion newly appropriated, the Congressional Budget Office estimates that only $26 billion will be spent this fiscal year and only $110 billion by the end of 2010. Using long, drawn-out processes to put money into circulation to meet an emergency is like mailing a letter to the fire department to tell them that your house is on fire. If you cut taxes tomorrow, people would have more money in their next paycheck, and it would probably be spent by the time they got that paycheck, through increased credit card purchases beforehand. If all this sound and fury in…. You are currently browsing the archives for the Glenn Beck category.